The remotely operated vehicle (ROV) on this cruise is small, about the size of a toaster. On either side are two wine-bottle-shaped protrusions; each has a propeller. It will be used to look at ice algae, which grows under and in the sea ice. 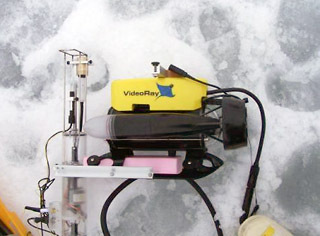 A scientist will drill a hole through the ice and drop the ROV in the water. A cable connects it to a control box with a joystick, a screen, and controls to make the ROV move. In addition to making video recordings of ice algae, this ROV will also measure oxygen concentrations very close to the ice. This information can be used to figure out how much photosynthesis is going on in and next to the ice, using sunlight filtering through it.